Utilizing the same equipment as B57 Truck Mount unit, this Mechanical Drill Rig is mounted directly on a tracked carrier enabling easy access to off road locations. Landshark Drilling owns 3 of these track mounted units to meet our customers demands to access sites that conventional truck mounted units have difficulty with. Delivering 20% – 30% more power than drills in its class, the newly designed B57 has undergone engineering upgrades delivering even more geotechnical performance. The new B57 includes a durable 14″ double disc clutch, new single speed RAD, redesigned transmission, rotary box, and more. This rig is equipped with an SPT Automatic Hammer with digital counter. 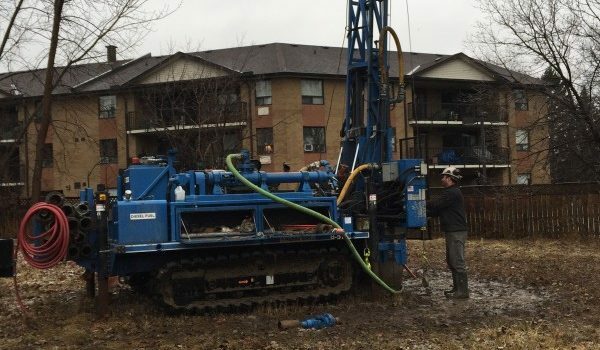 For more information on our Mobile B57 geotechnical and environmental drilling services, please call 1-855-586-3545 or email us at mail@landsharkdrilling.ca.